Several innovations have been developed to enhance the performance and durability of aluminum bats. The Fusion softball bat from Dudley Sports Co combines graphite and aluminum. Louisville Slugger’s Air Attack softball bat contains a pressurized air chamber in its hollow core, while its new TPS C405+ is the first triple-wall bat which contains two rings of coiled Springsteel inside the bat. Others are Easton Sports Inc’s bat made of a material used in Soviet aerospace called scandium and Worth Inc’s bats that were made using cryogenic technology. Metal-bat technology adopts exotic materials and designs for greater swing speed, distance, and durability – but it must limit performance for safety’s sake. Ever since aluminum bats burst upon the diamond in the 1970s, replacing the familiar “crack” of wood with the jarring “ping” of metal, the industry has turned into an engineer’s high-tech playground. Except that this is a $150 million-a-year big business. Aluminum has taken over an estimated 90 to 95% of the market, with wood bats remaining largely in the professional major and minor baseball leagues. Why? A hollow aluminum bat (all aluminum would be too heavy to swing) hits harder and farther than a solid wood bat. An aluminum bat can be made lighter to swing faster, and it can be made with a larger barrel to hit longer. A hollow bat can “give” under ball impact and spring back to its original shape. This “trampoline effect” results in less energy loss at impact and thus greater velocity off the bat. Plus, aluminum bats last longer than wood. All this has turned an old, traditional industry that crafted ash-blond and grainy, look-alike clubs into a colorful, exciting new arena of engineering innovation, some of it adapted from golf-club development. Competition is spurring exotic new materials and designs, as batmakers strive for increasingly higher performance – meaning greater swing speed and thus longer distances – along with durability. * The first bat combining graphite and aluminum, with the barrel end of the graphite composites covered by an ultrathin aluminum sleeve. * A bat featuring the first use of pressurized air in a chamber, like the air bladder in the midsole of an athletic shoe. * The first triple-wall bat, with two rings of coiled Springsteel inside an aluminum barrel. * The first composite bats made with scandium, a rare and expensive metal used in Soviet aerospace, reputed to provide the highest strength of any bat material. * Bats developed under the cryogenic process, where they are exposed to temperatures as low as -300 [degrees] F to enhance quality and performance. Graphite composites run the entire length of the $299 Fusion bat, while the aluminum sleeve covers 12 in. at the barrel end. This 0.065-in.-thick wall is the thinnest on a soft-ball bat, according to Dudley. (Typical wall on an aluminum baseball bat with high-strength alloys is around 0.110 in.) And for its next-generation Fusion bats Dudley is testing other metals, including titanium. With a titanium sleeve, the Fusion wall would be even thinner. The present Fusion bat is at least 20% stiffer in bending and 15% more flexible in the barrel than any single-wall C405 bat, resulting in higher energy transfer and increased trampoline effect, the company says. The unique C405/graphite composite design has resulted in a significantly lighter bat, with most of the reduction coming from the handle area. This was achieved without lowering “swing weight,” which is a measure of how heavy a bat feels when swung. A Fusion bat with a 30-oz swing weight actually weighs only 25 oz, Dudley says. A player can swing this bat 3 to 6 mph faster than an aluminum bat with the same swing weight. Result: 10 to 20 ft farther in carry, according to the Chicopee, Mass., manufacturer. Because of the aluminum/composite blend, Dudley has been able to move the bat’s “sweet spot” or center of percussion 1 to 2 in. farther from the handle for more consistent hits there. This spot, usually 5 to 7 in. from the barrel end of the bat, is the optimum place to hit for maximum energy transfer to the ball and least reaction to the batter. Batmakers are borrowing from golf-club technology. “The Fusion is basically a graphite shaft with a metal hitting area,” Loiars notes. “We’ve taken almost all the weight out of the handle with a composite and pushed it forward, increasing swing speed.” Like all other bats today, the Fusion is end-loaded, with as much weight as possible shifted to the end. This produces a “sledgehammer effect” from “so much more momentum,” he says. The Air Attack softball bat from Louisville Slugger, just introduced, also is made of C405 aluminum alloy, but its hollow core contains a pressurized air bladder. “It acts as a spring to reinforce the walls, increase durability, and change the sound and feel of the bat but add only minimum weight,” says George Manning, vice president of technical services for Hillerich & Bradsby Co. Inc., the Louisville finn which has been making bats for 111 years. According to Manning, this bat is the first with air in a chamber inside the bat. The bladder runs from near the barrel end to the transition portion, where the taper begins and near the label, approximately 10 in. from the handle. The bladder is a plastic material inside a woven textile to protect it from being punctured by any burrs inside the bat. This is done because a bat goes through “amazing distortions” at impact, Manning notes. Springsteel, the metal used in industrial springs, is known for shape-retaining memory and flexibility. A flat sheet of it is coiled into two wraps and loaded into the barrel end of the bat. Forces are applied to the inner walls of the barrel as the spring tries to uncoil, but are constrained by the bat’s walls. The thinner shell of C405+ is an enhanced version of standard C405 alloy. Springsteel stores energy and releases it back to the point of impact to propel the ball faster and farther. In addition, the weight of the Springsteel is evenly distributed throughout the barrel, providing a more balanced bat for increased bat speed. 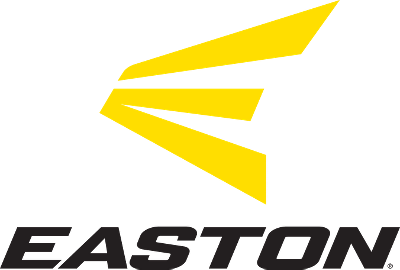 Easton developed the high-performance alloy in conjunction with Ashurst Technology Ltd. and Kaiser Aluminum. Ashurst is a Baltimore company that refines technologies developed in the former Soviet Union and turns them into products for world markets. These bats represent the first commercial use of aluminum-scandium structural alloys outside that country. The SuperCell Cryogenic softball bat has an extremely light shell and thin wall, and Worth’s Dual Energy Transfer System in which trampoline and springboard effects work together for optimum benefit. The company’s Power Load Suspended Weighting System concentrates more weight in the center of the barrel. Cryogenics enhances the Copperhead baseball bat which already had the largest sweet spot and longest, largest barrel in the game, Worth says. And a new high-performance end closure prevents flexing on the end, capturing the energy and transferring it back to the sweet spot to maximize trampoline effect. Since 1990 DeMarini Sports has been making what it calls the only double-wall bat on the market, the Ultimate Distance softball bat. Last year the Easton, Pa., company switched to Alcoa’s new C405 aluminum alloy (from the older CU31). This year it shortened the bat taper from 10 to 8.5 in. to boost swing speed. The barrel is also more rigid to increase trampoline effect. But it’s the double-wall technology that makes this bat the highest priced of all at $300. According to DeMarini, the Ultimate Distance “outperforms every other bat” because the inner cylinder expands the “incredibly large” sweet spot to 5 to 6 in. from the ordinary single-wall construction’s 1 to 1.5 in. The new Hollow Point softball bat is the most novel in that it comes with a choice of four end caps or plugs that can be screwed into the barrel end of the bat. A player can change bat weight in seconds – from 24 to 26, 28, or 30 oz. Bombat Sports Inc. claims this end lock of solid aluminum lets the bat be “tolerance tapered,” creating an enormous sweet spot. “All the weight of the plugs is within a half-inch of the end of the bat, producing a sledgehammer effect,” says developer Tony Daddario, vice president and general manager of the Faith, N.C., batmaker. Bombat claims its new technology outperforms and outdistances any double-wall configuration. However, the $250 Hollow Point is designed for training or recreational use only. The screw-in end makes it presently illegal in competition. New developments in materials will continue to spur batmakers. Louisville Slugger’s George Manning expects metal matrices and ceramic additions to metals that can enhance without adding weight will eventually be implemented. However, the limits being placed on bat performance and batted-ball velocity are presently causing the industry to focus on other product advantages. Bat “feel” and “forgiveness” are two areas he believes will become increasingly important. Feel is illustrated by the sting from hitting a ball off-center, particularly on a cold day. Louisville Slugger’s solution is its Sting Stop, an elastomeric material inserted into the hollow handle of a metal bat. For wood bats the company developed a mushroom-shaped plug that floats inside the handle and absorbs vibrations. However, the device is illegal in pro baseball, which demands a one-piece, solid wood bat. Bat “forgiveness” refers to performance when hit off-center. “If you hit at the sweet spot, the bat feels like it hardly met resistance. But when you hit off the sweet spot, the handle end of the bat goes through some displacement, and you feel it,” Manning says. “With a hollow metal bat we can rearrange the material distribution to change the inertia and stiffness of the bat to prevent that reaction and greatly reduce vibrations. Over the last few years, the rules bodies of softball and college baseball have become increasingly concerned about the higher performance of bats, from the standpoint of fielders’ safety and excessive home runs spoiling the game. Titanium was the prime offender, and it was outlawed in competition after it made softball bats lighter than ever before without sacrificing strength. Swing speed and thus ball velocity shot up, and so did distances. Batmakers have since adopted a laboratory testing method that involves firing a ball at a bat and measuring incoming and rebound velocity. From this the U.S. Slow-Pitch Softball Assn. (USSSA) devised a bat-performance factor (BPF). It’s a ratio of the coefficients of restitution of the ball and bat combination, as compared with a ball rebounding off a concrete wall, for example. The higher the BPF number, the greater the performance. A wood bat typically has a BPF of about 1.0, an aluminum baseball bat about 1.15, and an aluminum softball bat about 1.20, says George Manning, vice president of technical services for Hillerich & Bradsby Co., maker of Louisville Slugger bats. During the last year the USSSA ruled that a softball bat cannot exceed 1.20 BPF. The Amateur Softball Assn., the other major softball organization, is in the process of determining its standard. And the National Collegiate Athletic Assn. (NCAA) also intends to limit the upward spiral of performance. The NCAA is trying to establish a maximum ball velocity for a batted ball, a tricky task because this depends on many factors, including incoming ball velocity, swing speed, and the exact point of impact on the bat. Does corking a bat really help? Some major-league baseball players have “corked!’ their bats, or hollowed them out to insert a cork plug. This lightens a bat so it can be swung faster and hopefully result in greater distance. However, the practice is illegal; baseball rules require solid wood. But does corking even work? Does it result in greater distance and home runs? No, reports the leading wood bat manufacturer, Hillerich & Bradsby, whose Louisville Slugger models are used by about two-thirds of major leaguers. “In our testing, corking did not make a measurable difference in distance,” says George Manning, vice president of technical services. While corking does make a bat lighter and allow one to swing faster, this advantage is offset by the reduction in mass, which along with velocity determines momentum. “If you could swing the bat fast enough to offset the reduction in mass, it would increase distance, and apparently a number of players feel it is an advantage. But I think it’s almost all psychological,” says Manning. What corking does do is weaken a bat, he notes, adding that no batmaker would do it. Any corking done – and Manning believes it is not widespread – is primarily by players’ friends in their home workshops, he believes. * A bat used in the professional major and minor leagues must be solid wood, round, and smooth. Its barrel cannot exceed 2.75-in. diameter and length can’t exceed 42 in. Northern white ash is used in over 95% of all wood bats because it has just the proper tensile strength, resiliency, and weight required, reports Hillerich & Bradsby Co. Inc., maker of Louisville Sluggers. * A bat used in official softball competition must be round or three-sided, smooth, and made of wood, metal, plastic, graphite, carbon, magnesium, fiberglass, ceramic or any other composite material approved by the Amateur Softball Assn. It cannot exceed 2.25-in. diameter at the barrel, 34-in. length, or 38-oz weight. * A typical major-league wood bat weighs about 2 oz less than its length in inches. Average length is 33 in., and average weight is now 31 oz. * Most aluminum baseball bats have a 5-oz weight-length differential, and the most popular length in college baseball is 33 in. NCAA rules now allow at most a -5 ratio between length and weight of aluminum bats, meaning a 33-in. model cannot weigh less than 28 oz. * Nearly everyone in slow-pitch softball uses a 34-in. bat because it’s the maximum allowed. Typical weight is 28 oz and maximum allowed is 38 oz. Fast-pitch softball is played primarily by women, who typically use a 33-in. bat weighing 23 oz. * Today’s major-league baseball bats are much lighter, with thinner handles and larger barrels, than those of yesteryear. In the 1920s the average big-league bat weighed 40 oz. The heaviest bat ever was 48-oz by Ed Roush. Joe Morgan and Billy Goodman had the lightest, 30 oz. Al Simmons’ 38-in. bat was longest and Willie Keeler’s 30.5-in. model shortest. Ty Cobb and Honus Wagner swung bats that had nearly the same diameter in the handle as barrel. * Babe Ruth used a 36-in., 42-oz hickory bat. Present star Tony Gwynn of the San Diego Padres tried it once and said, “It felt like I was swinging a telephone pole. I don’t know how anyone could get that thing around on a 95-mph fastball.” Hank Aaron used a similar model to Ruth’s, but it was 35 in. long and weighed 33 oz. Cleveland Indian Julio Franco’s 36-oz bat is one of the heaviest currently in use. Lighter weight is the biggest reason for the continuing increase in cracked bats. * The most popular bat in the majors today was first ordered by relatively obscure Eddie Malone of the Chicago White Sox: Louisville Slugger model M110. The company makes about 300 different pro models. * Many materials and designs have been tried in bats over the years. A number of carbon-fiber composite bats have been attempted, but they haven’t been durable enough. There was even a dimpled bat, developed by an M.I.T. professor for improved aerodynamics. It could be swung 3 to 5% faster. However, the rules require a smooth bat, and dimples tend to damage baseballs. * Keeping the label up (or down, actually) on a wood bat is the way to hit. Hitting on the edge of the grain, which is much stronger, means the bat has less tendency to break. This doesn’t apply to metal bats, of course. In fact, aluminum bats carry printing all the way around so they will be struck on many spots, for longer life. Seven recommended specialized walking shoes are evaluated. Information is included on the price, construction and special features of each model. Buying specialized footgear for walking may appear excessive — until you consider walking’s biomechanics. Walking is a heel-to-toe motion; running is forefoot-to-heel, and running shoes often have heel wedges to facilitate this strike. So, if you’re walking in high arch support running shoes, you are actually impeding your natural movement and risking injury. Similarly, aerobic shoes, with their added forefront cushioning, are not designed for an efficient walking stride. And the stiffer midsole in cross-training and court shoes can restrict the flexion in your forefoot as you push off. Once you’ve decided you want a walking shoe, you need to check its rock ‘n’ roll. To help your foot roll easily, walking shoes have a good rocker profile — a flat heel with a toe that sweeps up, forefoot flexibility, low heels that are slanted outward for stability and evenly dispersed cushioning. You can examine the amount of “rock” in your shoe by pressing on the heel. The shoe should easily rock forward on the toe. To check for forefoot flexibility, hold the shoe by the heel with the point of the toe on the floor and press moderately on the middle of the toe; it should bend. Also, the tread on the ball of the foot should have forefoot grooves (sometimes called flex points) that flex as your toes bend. When you try on the shoe, make sure you have from a quarter-inch to a half-inch between your big toe and the end of the shoe, so your toes don’t get pinched in the push-off and landing stages. You also want a snug fit’ through the heel, so your heel doesn’t slide up and down. Some Achilles tendons are more comfortable with a notched heel — available in all models reviewed here except Ryka. Several models — Easy Spirit, Etonic, New Balance and Ryka — are especially sized to accommodate narrow and wide widths. Good traction is important if you’re walking on slippery surfaces. If you’re walking on pavement, which radiates heat, or if your feet sweat easily, look for a shoe that incorporates more mesh and/or synthetics into its upper. Leather is less breathable. A removable sock liner — available in all these models — allows you to air out or replace the liner. Our testers evaluated 15 walking shoes for fit, traction, flexibility, stability, comfort and breathability by testing two pairs each for a minimum of 10 miles on pavement and trails. Seven of these fashionable shoes for bunions made the top of our chart. The core of support in the Avia 375 ($60, 7.5 oz.) is its ArchRocker, a curved insert in the outsole that lends propulsion to the gait. Avia’s well-known cantilever design — the heel is cupped so the center compresses as your foot hits the ground — imparts both cushioning and stability. Our testers thought the shoe accommodates various widths and arches equally well. Synthetics in the upper promote good breathability and reduce the overall weight. Traction is excellent on both slippery pavement and trails. The Mach 1’s ($74, 12 oz.) biomechanics are straightforward. Two layers of shock foam, one in the sole and one in the sock liner, provide excellent cushioning, and its good rocker profile includes a beveled heel. Grooves in the sole at the foot’s flex point make the shoe very flexible and toeing off easier. The padded tongue and collar ensure a soft but snug fit. Testers thought the shoe was exceptionally stable and had good traction on both trail and pavement. Because of its leather upper, it lacked breathability. The Etonic Trans Am Walker ($53, 11.3 oz.) is an exceptionally stable shoe. Heel and arch cradles in the interior add lateral support, which counteracted one tester’s tendency to pronate. The grooves on this well-cushioned, sturdy shoe add good forefront flexibility to its rocker profile. A leather upper restricts breathability. The testers’ only concern was that the outsole grooving, which was fine on most surfaces, didn’t grip well on cinder trails. New Balance’s WK540 ($60, 9.5 oz.) offers stability and ruggedness with its solid rubber toe bumper and firm heel counter. The outsole grips well on all surfaces, and the “Walking Wave” midsole has a stiffer density in the mid-heel that extends into the arch for propulsion, providing good cushioning and rocker motion. A swept-up toe and low, beveled heel facilitate a good rolling motion. However, the leather upper doesn’t breathe well in hot weather. The centerpiece of Nike’s Healthwalker Lite ($70, 8.9 oz.) is the Air-Sole pocket in the heel, which offers additional cushioning during the heel strike. A Durathane plug in the heel also increases durability. The grooving in the outsole gives very good traction on all surfaces, including uneven boulders. Our testers also found it extremely flexible — “it gives you lots of push-off,” but not quite as stable as a less flexible shoe. They liked the fit, too: The slipper-like, neoprene tongue is snug and comfortable. The Healthwalker’s ventilated mesh panels are a step in the fight direction, but still don’t offer enough breathability. Ryka has pared the Nitrogen Ultra-Lite ($60, 7 oz.) down to a feathery seven ounces without sacrificing stability or comfort. Nitrogen Energy Spheres in the midsole provide excellent cushioning, and a higher heel collar gives good support. The shoe is the only one in our test without an Achilles notch, but our testers weren’t bothered by this. The padded collar and tongue are extremely comfortable. The shoe’s lightness keeps this all-garment leather upper (lighter than all-grain leather and less durable) breathable on hot days. The only drawback is that the shoe tends to slip on wet pavement. Saucony Jazz step ($60, 7.8 oz.) is very stable in the heel while providing excellent flexibility in the forefoot * The collar is lower than most of the sneakers for plantar fasciitis tested — a feature our testers found more comfortable but less stable in off-pavement conditions. Three flex notches in the forefoot section of the outsole provide excellent flexibility for toeing off. Testers thought the traction was excellent on all surfaces. Good use of mesh in the upper makes the shoe light and breathable. A well-known, time-honored brand name is like a piece of waterfront property, says Robert Mazzone, the new managing director of the Wittnauer brand, now owned by Bulova Watch Corp. You can’t make one–you can only buy one. A lot of companies seem to agree with him. The Sept. 5 announcement from Bulova that it had bought the 121 year-old Wittnauer brand for $11 6 mil lion ended a drawn-out bidding period in which several companies joined the fray. Taramax, owner of the Fendi watch license, wanted Wittnauer. So did Charles Watkins and Robert Coleman, the two executives who had been in charge of the brand since they bought it from Westinghouse in 1996 through their company, Composite Holdings. At least one other investor group was said to have bid for the brand. The scene was reminiscent of the bidding flurry that preceded Composite Holdings’ successful offer five years ago. Then, North American Watch Corp. (now the Movado Group), was rumored to be interested, as were Bulova and at least one other citizen dive watch company. Why do so many people want Wittnauer? It’s more than the brand’s long history and well-known name. Just as important is the brand’s ability to generate sales without a lot of promotional hoopla. As recently as 1995–when SMH U.S. (now the Swatch Group) took over U.S. distribution for Longines, breaking up the longtime Longines–Wittnauer duo, Wittnauer was a “cash cow,” says one former Wittnauer executive. It produced at least as much sales volume as Longines and much more profit, he says. This despite its having, through much of its history, a much lower profile than Longines. Albert Wittnauer founded the brand in 1880 as a less expensive, for-the-U.S.-only alternative to Longines, for which he was the U.S. distributor. Wittnauer seldom received as much promotional support as its more glamorous sister. Some say Bulova accutron will have its work cut out to make Wittnauer a cash cow again. Composite Holdings cut the brand’s advertising budget and had problems delivering product on time, sources say. Bulovais now evaluating the line’s stock keeping units to determine which ones did well. By spring, the company will have a full range of new models, most in the $395 to $795 range, and chiefly in the dress or dress-sport mode. The line will be Swiss; Bulova did not purchase Wittnauer’s assembly plant in Puerto Rico. Mazzone vows that from now on the brand will get the advertising support it needs. “Wittnauer is a jewel in the rough,” he says. After some polishing, he maintains, it will surely sparkle. With all the talk of mergers, acquisitions and musical managers, the merchandise could have easily taken a back seat at the fine watch world’s leading trade shows here and in Basel, Switzerland. At the shows, which ran from the end of March through last Tuesday, gossip percolating during the day and over cocktails and dinner each evening frequently centered around who was likely to acquire the LVMH brands owned by Mannesman, IWC, Jaeger-LeCoultre and Lang & Sohne, and how much they would cost. LVMH Moet Hennessy Louis Vuitton, the Swatch Group and the Vendome Luxury Group popped up most, but Rolex was also thought to be a possibility. Industry sources claim the bidding for Jaeger alone has already hit a fevered pitch — just under the $1 billion mark — though the brand has been valued at roughly $400 million. In another development, on the opening day of the show, it was announced that the U.S. operations of Jaeger would be run by Ronald Wolfgang, an industry veteran and former head of Ebel. He succeeds Nancy Fox, who left the company. LVMH had its own announcement: As of June 1, the American operations for its stable of watch brands will be consolidated under a new entity, LVMH Watch & Jewelry USA. The new company will handle operations for Tag Heuer, Chaumet, Christian Dior Watches and Fred watches and jewelry, and Susan Nicholas becomes president of the division. Nicholas is currently executive vice president and general manager of Tag Heuer USA. Previously, Dior and Fred were sold through Benedom Inc. Steven Kaiser, president and a substantial shareholder of Benedom, has sold his stock in the company, but will stay on through the transition, according to Nicholas. The Basel World Watch & Clock show ended its eight-day run March 30. It was followed by the high-end Salon International de la Haute Horlogerie here, which ran March 28 to April 4. With the U.S. market now the largest importer of Swiss watches — sales hit $956 million last year, an increase of nearly 14 percent — and demand showing no signs of abating, manufacturers at both shows were keen on attracting the attention of American store executives. “The American market is becoming more European, with a desire not only to spend, but to own several timepieces,” said Tag Heuer’s Nicholas, echoing the sentiment of most vendors that claimed to have logged very strong shows, despite the fact that there were virtually no major new launches this year. Even the most conservative firms injected renewed color and fashion into their offerings this year. Many also devoted considerable energy to expanding the breadth of merchandise specifically for women. And retailers found plenty to fill their cases beginning this summer and right through the critical holiday period. Rose gold, usually reserved for highly complicated men’s and vintage timepieces, was suddenly everywhere. Practically every brand, including more accessibly priced lines like Omega and Christian Dior, offered it, but several, such as Patek Philippe, really committed to the metal. Patek’s new versions of its hot “24” watch were entirely in rose gold. Oversized watches: Though they have been seen in fashion circles for some time, retailers are finally on board. Some styles were as large as 50 millimeters, or about 2 inches across, and included plumped-up crystals. They ranged from using the simplest of quartz movements to complicated versions from such names as Corum, Panerai and Fortis. Color dominated, from pastel pinks and blues to midtones in semiprecious and precious stones. Among the strongest examples of matching dials or stones with straps were Rolex’s new women’s Cosmograph, Concord’s Crystale, Harry Winston’s Aurora collection, Roger Dubuis’s Lady Sympathie and Jaeger-LeCoultre’s Cabochon Reverso. A striking contrast was the thrust in lines like Christian Bedat’s. His citrine-accented No. 7 watch was paired with a turquoise strap; another style had blue sapphires with a pale yellow strap. Chocolate or Havana brown dials provided another novel source of color. The desire for diamonds continues unabated, but instead of miles of pave looks, there were more pieces accented with center, baguette or square cuts. Diamond-laden lines included Cartier, Piaget and the ultra-exclusive Roger Dubuis. Even Coach added its first commercially available diamond piece. The fashion item of the season: tissot seastar watches with either large, leather cuff straps or double or triple-wrapped straps in leather or plastic. Hermes started the trend for double-wrapped straps at last year’s show, but now all the fashion lines — including Gucci, Guess, Calvin Klein and DKNY — have added their own versions. The depth of the fashion focus was best explained one way, according to some store executives. “The way the economy has gone in the U.S. now, many of our customers have become very wealthy, very fast, and at a younger age. In the past few years, they have satisfied their initial desires and are now searching for something that is newer and sets them apart,” said Tim Braun, fine watch and jewelry buyer for Neiman Marcus. Braun singled out Franck Muller for his “exciting design concepts and tremendous fashion sense; Piaget for its new directions, which he said would “light up the luxury consumer,” and the eclectic feel at the venerable Corum brand, which is now being run by the team that built Gucci watches. While Jennifer DeWinter, vice president and associate general merchandise manager at Saks Fifth Avenue, said there wasn’t much that was completely new, there was a lot of very salable merchandise to be had. She also lauded Bulgari’s new Rectangelo watch and said she felt the extensions in Baume & Mercier’s Capeland, Hampton and Catwalk lines would keep the momentum going on what are already strong sales. John Green, president and chief executive officer of Lux, Bond & Green, was enthusiastic about the combination of new products and their salability. London Jewelers. based in New York, singled out Franck Muller as a big hit, particularly since one of Muller’s new stuhrling original watches is called Long Island. Udell also stocked up on Patek Philippe’s “24” in rose gold and said he liked the variety of colors in the Rolex Cosmograph. Like other retailers, Udell expressed mild trepidation about whose hands the LMH brands would end up in. Distribution, not surprisingly, was a key factor for Samuel Getz, president and chief executive officer of Mayor’s Jewelers. The company, which has been concentrated in Florida and Georgia, will go national this year, opening nine stores, beginning in June with a unit in Tysons II in McLean, Va. Other locations to be rolled out are in the Somerset Collection shopping center in Troy, Mich.; Fashion Island in Newport Beach, Calif.; Desert Passage in the Aladdin Hotel in Las Vegas, and StoneBriar, a new mall outside Dallas. As for product, Getz said he was most interested in offerings at Girard Perregaux, and the direction at Piaget and Baume & Mercier. While Getz was less enthusiastic than others about the opportunities for watches and jewelry in rose gold, he said he expected white gold and big watches to continue to be strong sellers. From dangling on the verge of oblivion, 10 years ago, TAG Heuer has become the most popular high-end sports watch in the world, and the fifth-best-selling Swiss watch brand, after Rolex, Cartier, Swatch and Omega. Back in the early 1980s, the flood of Japanese digital watches turned into a tsunami that deluged the Swiss watch industry. One of the little Swiss fish that nearly drowned was Heuer, which had been founded in 1860. Near bankruptcy, Heuer was rescued in 1985 by a billionaire Saudi family, through their holding company Techniques d’Avant Garde (Tag). The new owners renamed the company TAG Heuer and called in Booz Allen & Hamilton, the international marketing consultants based in McLean, Va., who told them to stop trying to compete in a broad variety of watch styles and markets and, instead, stick to their traditional strengths in high-performance sports watches, and concentrate on the high end of the market. Today, TAG Heuer, based in Marin, Switzerland, sells about 700,000 watches a year, in more than 100 countries. The secret of TAG Heuer’s success is a distinctive product design that’s well matched to a narrowly defined product identity. But the company also got lucky by taking aim at an upscale sports market niche at precisely the right moment — in the late 1980s — when “young achievers,” as TAG Heuer president Christian Viros likes to describe his market of 20- to 45-year-olds, were starting to make serious money. At the same time, they lead active lives, and think of themselves as being sporty and casual. To appeal to this “niche that became a segment that turned into a market,” said executive vice-president Luc Perramond, and become the kind of wrist watch that goes well with a BMW, the new managers of TAG Heuer gave their designers a brief that would lead to a consistent family appearance across the entire product line. In sports watches — more than dress, where esthetics reign supreme — function dictates design. The new TAG Heuers would be waterproof to 200 metres and have a screw-down crown, for maximum water resistance. It would have a large, movable bezel (the metal ring that frames the dial), so that it can be used as a timing scale, and luminous markings, so that it can be read in the dark. Status-conscious watchn spotters will still recognize it across a room as a TAG Heuer. Meth goes by several street names–speed, crank, ice, crystal, chalk, and zip–and looks deceptively harmless. The drug can be smoked, injected, snorted, or swallowed. Regardless of how it’s taken, How long does meth stay in your system has the same basic effect. Meth is often referred to as the “poor man’s cocaine” because, like cocaine, it is a central nervous system stimulant. Users say they take meth to increase their energy or to heighten their focus on tasks. In the 1930s, amphetamines were a common ingredient in diet pills. But the drug turned out to be addictive and had serious side effects. The U.S. government banned almost all medical use of amphetamines in the 1970s. Today meth is legally available only in small prescribed doses to treat conditions such as narcolepsy (a sleep disorder). But organized-crime groups and independent “cooks” produce potent street versions of the drug in illegal labs. “Meth now is much more powerful–probably two or three times as strong–because the production process has been refined,” observes Steve Hedrick of the California Methamphetamine Strategy, a campaign to combat the drug’s use. Amber was only 12 when she first tried meth. “I had trouble opening up to people and was a loner,” reveals Amber. “Meth made me get out of my shell. I didn’t want the feeling to go away.” Soon, though, her feelings changed. Recovery can be tough for many meth users. Bingeing on those feel-good chemicals can hurt the brain’s ability to make more of them, so meth addicts often deal with depression for several months after stopping. They also suffer from memory loss. Without saliva, bacteria in the mouth multiply, leading to decay. Dry mouth also makes users crave sugary drinks, which exacerbate the damage. Because meth makes users feel agitated and jumpy, they are prone to grinding their teeth. Dentists report that healthy teeth can become rotten from even a few months of meth use. Treatingmeth mouth often means pulling teeth and inserting costly implants. One dentist says that a severe case of meth mouth forced him to outfit a 17-year-old meth user with dentures. To learn more about meth abuse, go to www.teens.drugabuse.gov and search for the word meth. * What is crystal meth? * What is the scope of the meth problem? * What are some of the reasons that people in the article started using meth? What happened to them? * Why can recovery be difficult? Methamphetamine addiction is a serious problem in countless communities across the United States. Divide the class into two teams to research and report on two different aspects of the problem: methamphetamine’s effects on communities and its effects on individuals. Have teams present their research in class. Compile a collection of newspaper and magazine articles that detail the many aspects of the problem. For teen-focused information about methamphetamines, visit Focus Adolescent Services online at www.focusas.com/Meth.html. The site offers meth-related links and resources for teens. Crystal Meth Anonymous is a 12-step recovery program for meth users. It is online at www.crystalmeth.org. If you are searching for a world class quality diver’s wristwatch at an affordable price, then you are looking at the right place. You will find an exact outline for choice after going through this Invicta watch review completely. You will find it to be a straight opinion of the actual buyers. So, here’s the winning list of watches from Invicta for a Pro diver like you. There are two words to describe this piece. Magnificent art. Both in terms of appearance and working. It reads sophistication, class, precision along with time. Every part of this watch is a huge highlight. Firstly, the bracelet is huge and sturdy and silver toned stainless steel. The bracelet is beautiful with the links connected intricately. It looks like a meticulous piece of art that befits even a king. The dial is deep blue in color with three sub dials that indicating minutes, date and month. A date display is present at the four o’clock position. A darker blue toned bezel is fitted at the top. It is unidirectional with minute markers. The dial also has Tritnite hour marking in dots and all the three hands are also Tritnite. Making it possible to read the time in dark places. A flame fusion crystal for protecting the case, Swiss quartz movement for precise operation and resistance in water up to 200 meters depth, reasonable cost are the few of the attractive features. You can purchase the same watch for slightly different price. The watch will be 18k gold plated replacing the silver tone everywhere and dial color will be either black or blue. This is a favorite among buyers as per the Invicta watches review by the buyers. The striking silver and black colors have a fine contrast. The band is a combination of silver toned, brightly polished stainless steel and black polyurethane rubber. The pattern is very masculine and sporty. So, the case is also stainless steel fitted with unidirectional bezel which is also in silver tone. The deep black dial with Tachymeter, the screw down pushers and the screw down crown and water resistance till 500 meters depth are some of the unique features of this watch. The hands, all three of them are luminous due to the Tritnite. The hour markers are also made with luminous Tritnite. A date window is positioned at the four o’clock position. There are three sub dials for indicating 1/10 second, 60 seconds and 30 minutes. It is a huge hit among the buyers. The watch is very huge for real and very bold. So, the band is again a combination of gold plated stainless steel and black rubber. The highlight is the dial. You can find pictures online. Take a good look at the trio of sub dials with date a display window. It is water resistant up to 100 meters depth and weighs 1.1 pounds or half a kilo. Jewelry and watch designers have eagerly met the growing demand among women who wish to wardrobe their watches. Women’s watches proliferated at BaselWorld, appearing in every shape, size, color and price point. Pastel shades and feminine forms like hearts and flowers appeared most popular, and many designers seemed to have taken a cue from fashion trends while crafting their newest timepieces. Many of the women’s watches shown at Basel had straps made of nontraditional materials, from stingrays to pearls to silk. The charm bracelet trend that has taken hold in the fashion jewelry arena has also asserted its influence within watches. Designers showed timepieces that hung on charm bracelets or were surrounded by tiny charms featuring letters, hearts, moons or stars. Other watches came with dangling briolette gemstones or pearls, reflecting a general trend in jewelry toward movement. 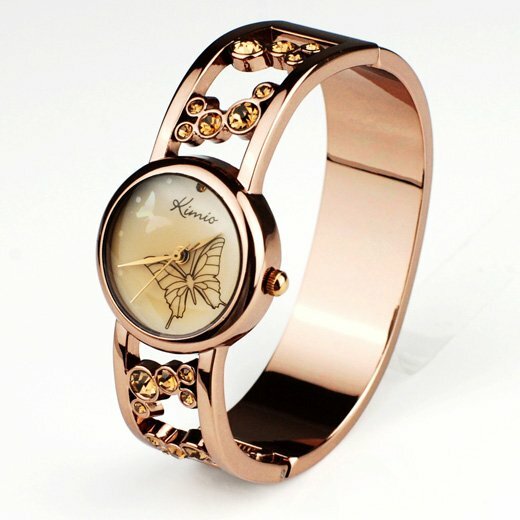 Several jewelry designers have noted the interest in fashion watches, offering timepieces with a distinct jewelry feel. Jewelry designer Pippo, which launched its watch line in October, showed some exciting new pieces at BaselWorld. One highlight: the My Panse collection, which includes flower-shaped watches with topaz petals and diamond accents on bright sateen straps. Echoing a trend among many designers, the watches feature interchangeable straps and are streamlined to fit a woman’s wrist. Another jewelry designer making the jump to watches is H. Stern, who crafted his Golden Stones watches to correlate to the jewelry collection by the same name. “It befits our tradition as a jeweler to have the watches come from the jewelry line,” says spokeswoman Andrea Hansen. The watches use the same organic, asymmetrical shapes as the jewelry line, and come in a variety of materials including 18-karat gold, stainless steel and diamonds. Straps are made of leather or satin, and are long enough to wrap around the wrist three times. But even traditional watchmakers have taken note of women with their collections this year. Watch company Ritmo Mvndo uses varying colors and textures to make all of its watches unisex, says spokesman Stefan Pollack. By adding colors like pink and baby blue, and dotting cases with diamonds, even their largest watches take on a decidedly feminine feel. Philip Stein Teslar went in the other direction, creating a new women’s “mini” watch similar in size to a small bangle, with a slender case shape and a petite strap. Available in stainless steel or 18-karat gold, it comes with or without diamonds. Changeable straps come in satin, lizard and alligator, in hues like orange and kiwi. Watches are the latest item to attract designer licensing deals. As watches become more of a fashion accessory, and consumers start buying wardrobes of watches, designers are capitalizing on the trend. Bill Blass watches are distributed by Robert Tabakow Co., a division of Jewelcor, Inc., based in Pennsylvania. Tabakow handles 10 other designer names including Givenchy, Nina Ricci, Oscar de la Renta and Pierre Cardin. A Jewelcor division, Gruen, manufactures the Blass watch line. Blass receives royalties between 5 and 10 percent, according to Earl Zimbler, vice president of marketing at Tabakow. The line wholesales from $45 to $135 and currently it is Tabakow’s biggest volume generator. Through another licensing pact, Tabakow was recently named the exclusive distributor of Oscar de la Renta watches, manufactured by Martin Newman International. 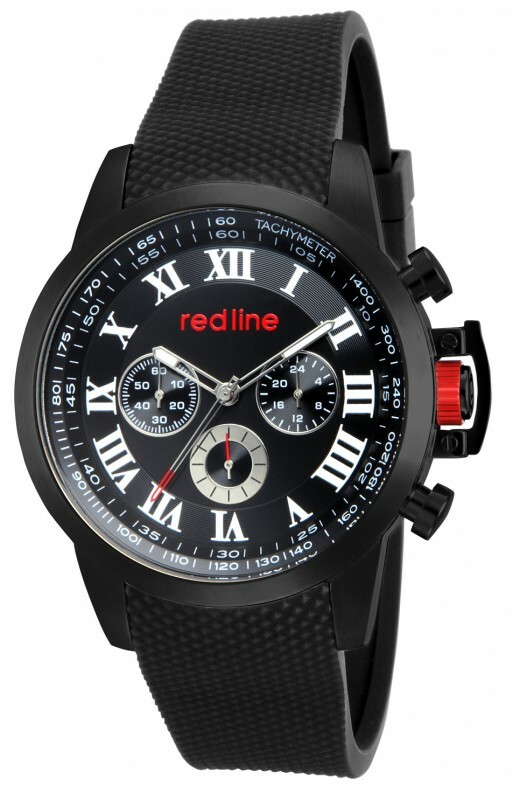 Martin Newman, owner, said the designer approves all designs for the watches, which wholesale from $60 to $125. Tabakow will sign still another watch licensing agreement with Givenchy in June to be its executive distributor in the United States. “The watches used to be available primarily in our boutiques. We are expanding our distribution because the market for designer watches is rapidly growing,’ said an executive at Givenchy. Steve Holtzman, vice president of sales at Tabakow, attributes the growth in the watch category to the success of Swatch watches. Christian Dior is already an established watch name in Europe. Christian Dior-New York has licensed the Dior name to manufacture a line of watches for distribution in the U.S. by Memox Corp. Memox does private label watch lines for some major department stores. According to James DeMattei, vice president of Memox, Dior’s New York and Paris design staffs were involved in the designing of each watch in the collection, which took a year to develop. “We wanted the look of the watches to be clean and fresh, like the Dior look. The watch completes the total Dior look from head to toe,’ he said. The collection will wholesale for $95 to $140; Dior will receive between 5 and 10 percent of sales in royalties. “We are in the fine jewelry price range and retailers are looking to develop this area, because there are so many watches at lower price points,’ said DeMattei. Calvin Klein also recently introduced his watch collection by Emerich Meerson, which has licenseed the Klein name. The watches retail from $175 to $475, and opened in the stores in May. As the boom in all things luxury continues, retailers and manufacturers report heightened attention to gold watches from consumers who seek to make high-quality purchases. “We always sell more women’s gold watches than men’s gold watches because they’re given as gifts,” says Marcos Salerno, owner of Salerno Fine Jewelers in Elizabeth, N.J.
Salerno sees strong gold watch sales in both white and yellow gold–particularly those by Festina, a trend he attributes to the brand’s lower price point. Festina representatives say they have received similar feedback from other retailers. “The gold business in general–in yellow and white, but particularly in yellow–is going crazy right now,” says Phil Schwetz, Festina vice president, sales and marketing. According to Festina President Larry Lichs, the rising price of gold and the inherent value of an 18-karat gold watch have helped drive the demand. “People see [gold watches] as an investment,” he says. Many retailers and manufacturers who spoke with NATIONAL JEWELER report rising sales of gold watches, although the color, price range and gender preferences seem to vary by retailer and region. Representatives of Swatch brands Omega, Longines, Breguet and Tissot report higher demand for gold watches overall, as do those from luxury brands Patek Philippe and TAG Heuer. At Tourneau, top sellers include white gold day-date Rolexes, rose gold pieces with complications from Jaeger-LeCoultre and Zenith, and ladies’ watches from Cartier and Patek Philippe, reports Senior Vice President Andrew J. Block. “We are seeing a continuing trend in high sell-through of gold watches,” he says. Jeff Horlacher, owner of Horlacher Jewelers in Colby, Kan., has upped the number of gold watches offered from his private-label brand, due to greater demand. Horlacher says yellow, white and rose gold watches all sell well, with most falling into the $1,000 to $3,000 price range. Men tend to prefer yellow gold watches, while ladies’ gold watches generally sell best in white, he says. Dunn’s top-selling brands include Breitling, Rolex and Corum, with gold watches routinely commanding $20,000 to $30,000 at retail. Gold watches by Rolex, Patek Philippe and Cartier are in demand at Rummele’s Jewelers of Green Bay in Green Bay. Wisc., says manager David Tomaschefay.